This post was last updated Friday, September 21, at 11 a.m.
Summer is winding down, but never fear, our commitment to bringing you all the latest on the multitude of Boston’s seasonal beer gardens continues. We have a sunny outlook on the city’s outdoor drinking scene, with new beer gardens opening in August and September, more nights to drink outside, and some al fresco draft exclusives. Local craft beer producers hopped to it this spring, rolling out draft trailers and setting up the picnic tables on the Greenway, in Central Square, City Hall Plaza, and beyond. From an Oktoberfest-style pop-up south of the city to a new Somerville brewery popping up downtown, here is the latest Boston beer garden news. For the busy people of Aeronaut Brewing Company, one offsite beer garden is not enough. 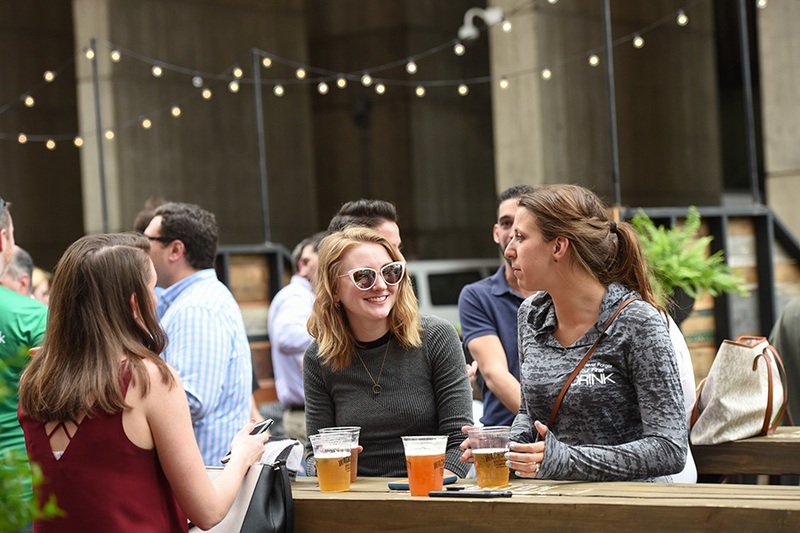 A second, family-friendly beer garden joined Aeronaut Allston in early July, bringing an eclectic lineup of live music, food vendors, and beer and cider to downtown Arlington. It happens every Saturday through late September. Meanwhile, the pop-up party at Zone 3 on Western Ave. continues every Wednesday and Friday evening, and has expanded to Thursday nights as well. Aeronaut Arlington, Saturdays, noon-7 p.m., Whittemore Park at Massachusetts Avenue and Mystic Street, Arlington, Facebook. Aeronaut Allston, Wednesdays, 5-9:30 p.m., Thursdays, 5-10:30 p.m., and Fridays, 5-11 p.m., Zone 3, 267 Western Ave., Allston, zone3westernave.com. After a public safety concern derailed the Norwood-based brewery’s plans for an open-air beer bar at Underground at Ink Block, Castle Island continued to work with real estate firm National Development to find an alternate location. 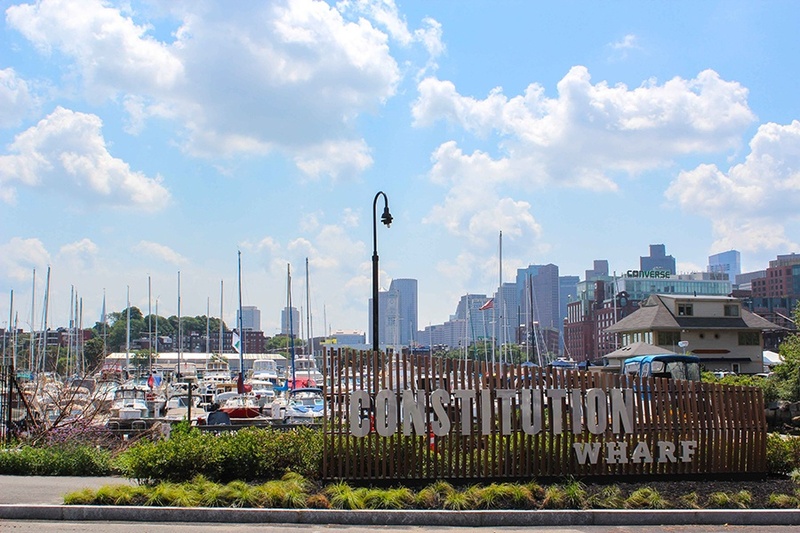 It opened in early August at Constitution Wharf, directly on the Boston Harbor and the Harbor Walk. Keeper IPA, American Lager, Hi-Def DIPA, Candlepin, and limited releases flow from the draft trailer, with the city skyline and Old Ironsides in view. It’s open, weather-permitting, through October. Thursday-Saturday, 2-10 p.m., Sunday 11 a.m.-7 p.m., 1 Constitution Wharf, Charlestown, castleislandbeer.com. 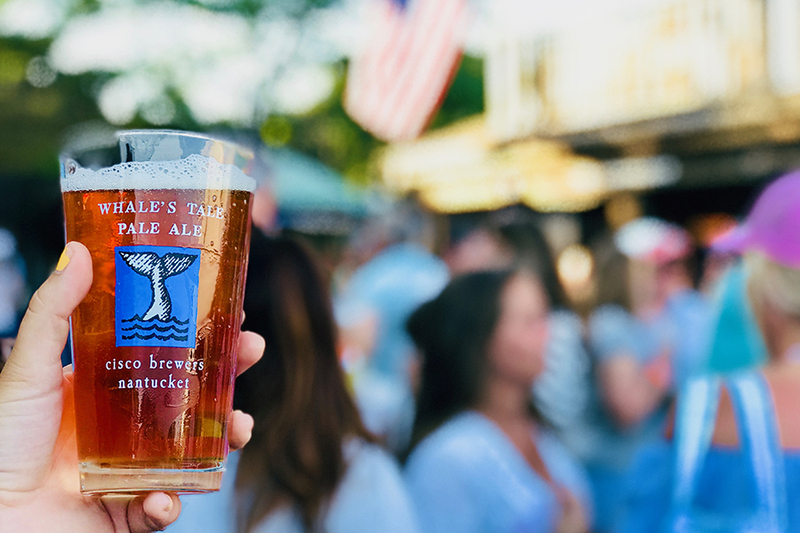 Your next trip to Nantucket might be a winter away, but never fear: The island’s beloved brewery is shipping up to Boston—a new location beyond even its recently opened Portsmouth, N.H. brewpub. 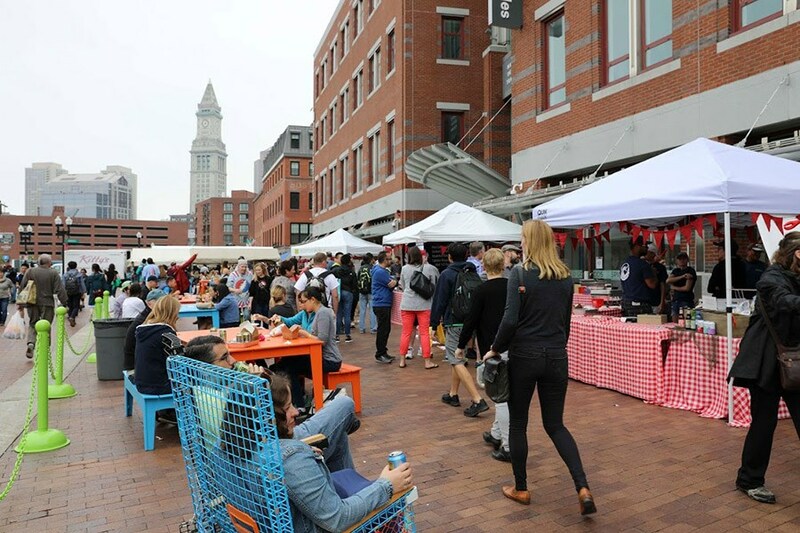 Beginning Wednesday, Aug. 29, Cisco Brewers is popping up outdoors in the Seaport, weekly through the fall from Wednesday-Saturday. Alongside a tap list of favorites like Whale’s Tale Pale Ale, Grey Lady Wheat Ale, and the new year-round grapefruit session IPA Gripah, South Boston’s own Loco Taqueria is serving up oysters and tacos. The al fresco bar will also serve Cisco’s Nantucket Vineyards offshoot wines and ciders. A portion of sales from the pop-up will support the Massachusetts Fallen Heroes Memorial Fund. Wednesday-Friday, 4-11 p.m., Saturday noon-11 p.m., 84 Seaport Boulevard, ciscobrewers.com. 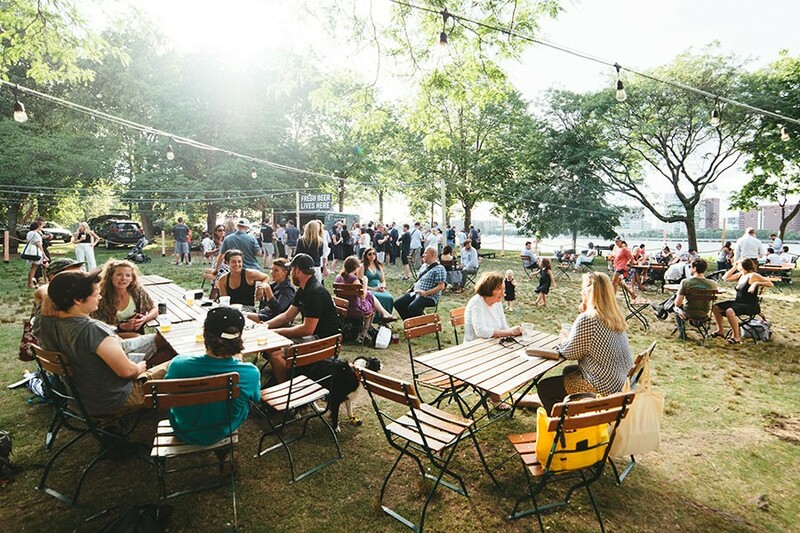 Two Charles River-adjacent beer gardens take flight this summer: Night Shift is operating two bars in partnership with the Department of Conservation and Recreation, and the parks’ non-profit stewards. The first Owl’s Nest Craft Beer Garden, as they’ve been dubbed, opened early August at Fiedler Field, near the Hatch Shell on the Esplanade. On Saturday, Aug. 18, another landed in a grassy field next to the restored Herter Park amphitheater, off Soldiers Field Road in Lower Allston. Both are family- and dog-friendly, and serve Night Shift beers, plus other brews, ciders, wines, and non-alcoholic options from Night Shift Distributing. Check Instagram and Twitter for updates. Fiedler Field, Wednesday and Thursday 4-10 p.m., Friday and Saturday noon-10 p.m., Sundays noon-8 p.m., Charles River Esplanade, Boston. Herter Park, Saturdays noon-10 p.m. and Sundays noon-8 p.m. plus additional dates TBA, 1175 Soldiers Field Rd., Lower Allston, nightshiftbrewing.com. Since May, this Salem brewery has taken its session beer on the road to scenic locations throughout the state in partnership with the Trustees. The events—which feature beer garden seating, string lights, and traditional ceramic steinkrugs—have been so successful that dates continue to be added into November. 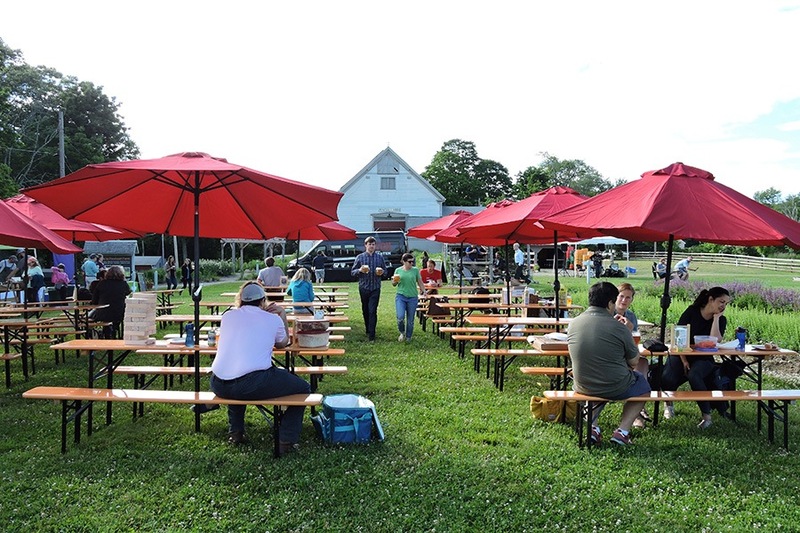 Upcoming Notch biergartens take over the Fruitlands Museum in Harvard, Appleton Farms in Ipswich, and the Crane Estate. Find out the full schedule at thetrustees.org. The Wachusett Brew Yard is pouring pints of Westminster-brewed Wally IPA, Wachusett Boo-Yeah! Pumpkin Ale, and more as part of the Patios installation at City Hall Plaza, but autumn brings some new excitement: Fall smells are piping into the area until the Patios close on October 14, making the central gathering spot the first outdoor, open-air location with a lightly scented breeze of pumpkin spice and apple cinnamon (we are not kidding). Westminster bakery Bittersweet Homestead is set up six days per week with zucchini and banana bread, apple cider donuts, charcuterie, pretzels with pub cheese, hot chocolate and more; and the cozy private Patios have TVs streaming NFL action this season, too. Wachusett Brew Yard at the Patios, open through October 14, Monday-Wednesday 4-9 p.m., Thursday-Friday 4-10 p.m., Saturday-Sunday 11 a.m.-10 p.m., Faneuil Hall Overlook Area at City Hall Plaza, 1 City Hall Square, Boston, cityhallplazaboston.com. The Best of Boston food market is getting in on the seasonal sip situation: The Greenway-adjacent plaza outside Boston Public Market hosted Willie’s Superbrew in July and August, but Somerville’s new Remnant Brewing takes over beginning Friday, Aug. 24. Alongside a selection of food from BPM vendors, Remnant will pour pints of two beers each week, and bring along a limited number of crowlers (32-ounce cans of beer) to go. Bites + Brews with Remnant continues through September 30 every Friday from 5-8 p.m., Saturdays from noon-8 p.m., and Sundays from noon-6 p.m.
100 Hanover St., Boston, bostonpublicmarket.org. 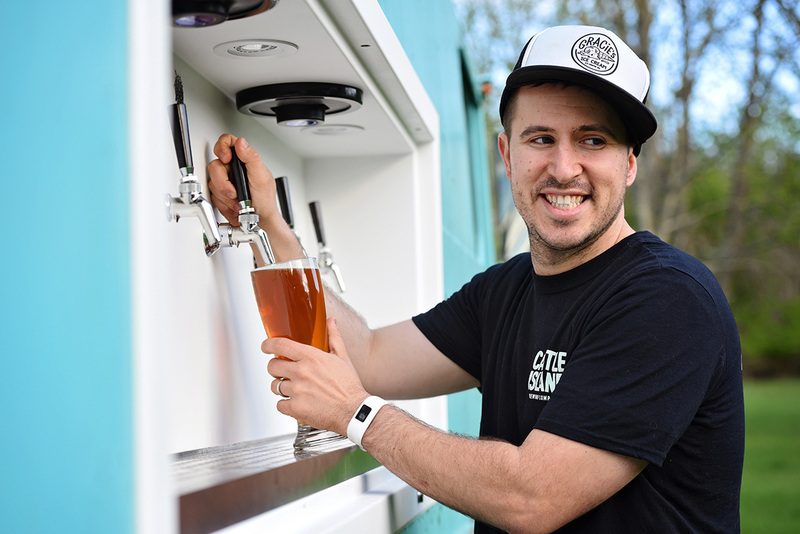 Chef and entrepreneur Avi Shemtov (of the Chubby Chickpea) brings his Tapped Beer Truck—and “the spirit of Oktoberfest”—to Braintree, with a weekly setup at Town Hall beginning Saturday, Sept. 8. 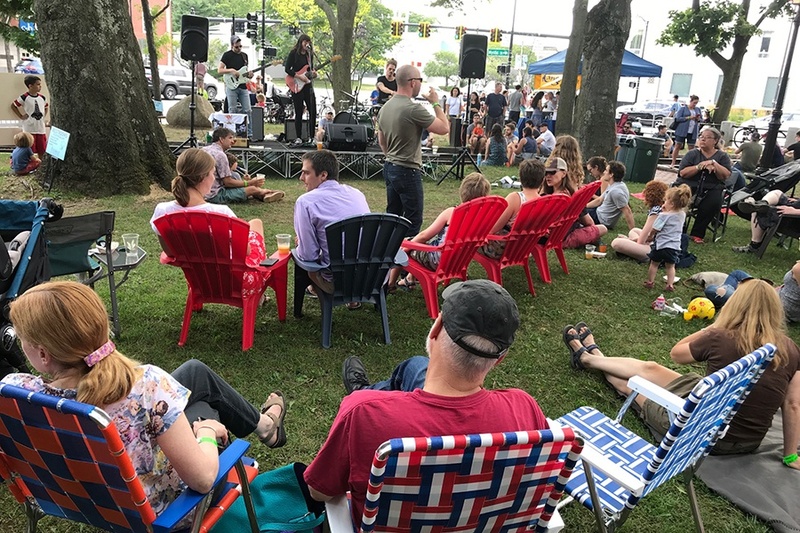 The beer garden pops up next to the community’s farmers’ market (which runs 9 a.m.-1 p.m.), with a lineup of local brews sponsored by Craft Beer Cellar Braintree. Proceeds from the fall series will benefit Braintree Day, an annual celebration of American independence. The Tapped beer garden is accessible with a short walk from the Braintree Red Line Station, and also by car via the Braintree Split. Saturdays, Sept. 8-Oct. 27, noon-5 p.m., 1 JFK Memorial Dr., Braintree, tappedbeertruck.com. The American Fresh Beer Garden has returned to Assembly Row, open daily nearby the full-scale Slumbrew pub that opened there last year (and the newest location of the Smoke Shop). Craft Collective continues to fuel the SoWa Beer Barn every Sunday afternoon. The Downeast Cider Back Porch on the Greenway takes over Dewey Square every Monday, Wednesday, Friday, and weekend. The Trillium Garden on the Greenway provides shade near Rowes Wharf every Wednesday-Sunday. 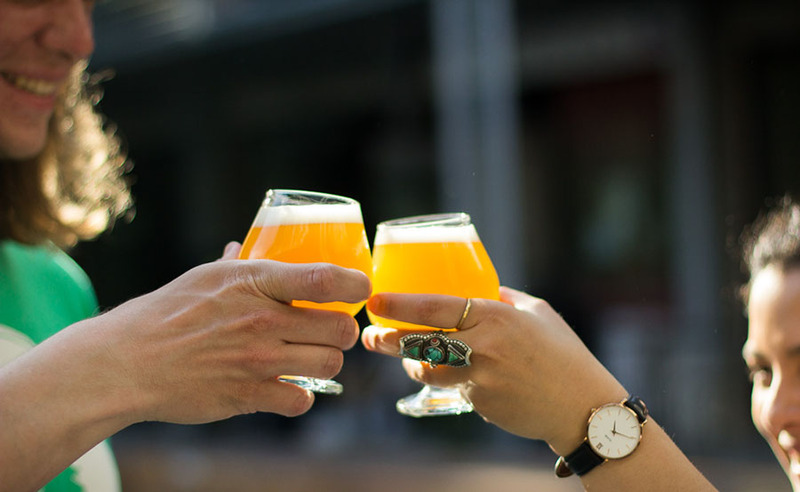 Lamplighter sparks the party during the Central Flea every Sunday, with rotating beer options including a ginger shandy collaboration with fellow market vendor, Bon Me.